Best location in Los Barriles! Is also wheelchair accessible. (adjacent Owner's home Casa Dina II - now available - VRBO #1001301) Any international credit card chargers must be paid to the owner upon arrival. Casa Dina I is steps from the ocean and minutes to town. This new Villa boasts panoramic views of the Sea of Cortez. Surrounded by palm trees and beautiful landscaping. Sandy beaches! 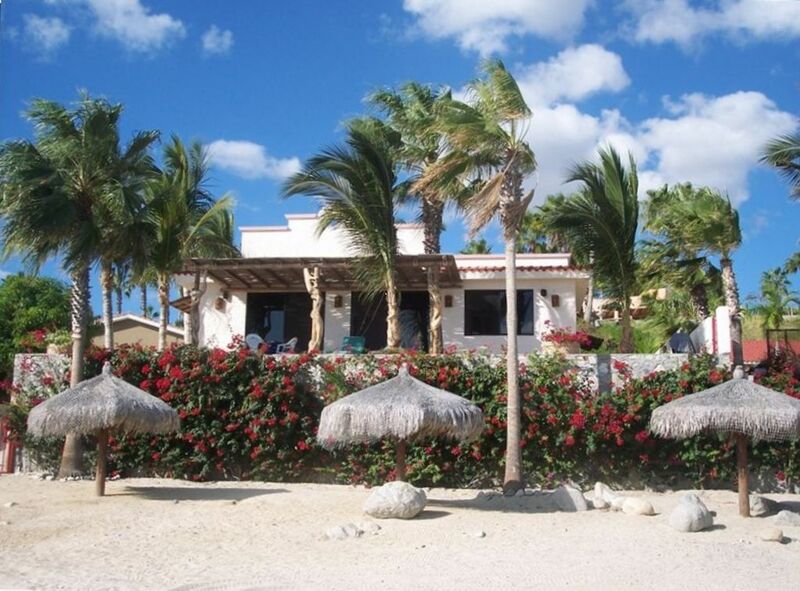 Enjoy swimming, snorkeling, Kayaking and surf fishing right in front of Casa Dina I. We provide 3 kayaks, snorkel & surf fishing gear for guest use. Inside this spacious home you will find a fully stocked kitchen. The dinning room and living room has comfortable furniture, reclining chair and sofa. Sofa is also a sofa bed. California king bed in Master bedroom and Queen in 2nd bedroom. Large walk in showers in both bathrooms. Second bedroom is attached and has its own entrance for extra privacy. This home is secure, gated and very private. All Black top roads. A perfect romantic getaway! Please check with owner for correct quotes A perfect family or adult vacation! My husband and I have been living in Los Barriles for 12 years. Our home is next door to Casa Dina. It was built in 2009. We absolutly love it here and look forward to sharing our piece of paradise with you. This property is only 3 years old. Everything is new. The home is fully stocked with everything you would need. It has a Beautiful patio with panoramic views. Steps from the Ocean. Close to town, No dirt roads. Very private and gated. We have fishing, kayaks and snorkle gear for guests use. Free of charge. We live next door and are here at your service for anything you may need. If it is your first time here in Los Barriles We will give you a tour of our town. Pointing out the best restaurants, grocery stores, banks etc.. We will also connect you with fishing charters, and basically any activity you would like if you need. Casa Dina I is very private we are here to help if you need us but we are never intrusive. Please check under rates for accurate quotes. Thank you! 5 kayaks and 3 paddle boards for your use! We will be happy to help you with a fishing charter. Lovely accommodations right on the Sea of Cortez. We will be back! Just WOW- 2nd time back and many more to come!!! MUST STAY!!!! We absolutely LOVE Casa Dina!!! This is our second time back since September and we can’t say enough amazing things about this beautiful home and the amazing host- Duke! The location is incredible, directly on the most peaceful beautiful quiet beach where you can walk into town within 15 minutes! Duke’s house has paddle boards, canoes, snorkel equipment and you can even rent an ATV to ride on the beach or into town! The restaurants here are delicious, fun, and so well priced!! Every morning we would go paddleboarding over the glassy water to find eels, tropical fish and so much more! We saw whales and dolphins directly from our gorgeous patio on the beach almost daily! It truly feels like the most relaxing perfect getaway imaginable. It was also wonderful being able to cook our own meals. One day we hired a cook and had massages in house over looking the water! Duke and his very sweet rescue dog Gia were so helpful and hospitable! He was always there to answer our questions and assist us when needed! This is truly a gem and the best find imaginable! We are already counting down the days until we can return to our new “happy place.” I can not say enough amazing things about this home and our experiences here!! You will not be disappointed!!! Thank you Duke for everything!!! Your home is truly so special!!!! Gorgeous house, beautiful beaches, didn't want to come home! The house is well-stocked with necessary amenities, has INCREDIBLE views, and we loved the private back room for the kiddo (so did he, I'm sure!). We felt right at home instantly and this house is just close enough to town, but not smack in the middle of it. It was nice and quiet at night, with comfy beds. Semi-private access to the beach is an excellent bonus. The wind slowed down our water activities a bit... but the kite-boarders were having a ball! We truly did not want to leave. This is the second time we've stayed at Casa Dina and for good reason. The rental is incredible clean, cozy, and has any amenity you could really need on vacation. The location is AMAZING! The sunrises and sunsets are incredible. The host is incredibly hospitable and helped us book a fishing boat that picked us up on the beach right in front of the rental. The host was very helpful with recommendations on anything from places to eat to live music!! We will definitely be back for a third trip! Our stay at Casa Dina was awesome. The owner met or exceeded our every expectation. The place is amazing. Quaint, clean, convenient, great host. Family trip with another family in Los Barriles (other family stayed in a different house further north). This house is south of the main strip of hotels, restaurants and kite surfing venues. Walkable, but we had an ATV. Great beach for Los Barriles, which has a lot of coarse sand to cobble stone beaches. Duke was friendly and accommodate. Would definitely stay here again.